This graceful, historic Connecticut River town is a painters' paradise, and has been for over a century. Anyone interested in American painting—especially American Impressionism—should stop for a few hours, a meal, or overnight. Settlers from Saybrook founded Lyme on the east bank of the Connecticut River's mouth in the 1640s, and by the 1650s the town was exporting barrel staves to the West Indies. Lyme prospered in the 1700s and 1800s, during which many of its fine old churches, houses and public buildings were constructed. During the late 1800s and early 1900s it became a summer art colony favored by painters. The less wealthy boarded in the fine old (1817) mansion of Miss Florence Griswold on Lyme Street, now Old Lyme's most noted art museum. American Impressionists whom Miss Griswold admired, including Charles Ebert, Childe Hassam, Willard Metcalfe, Henry Ward Ranger, and Guy and Carleston Wiggins, decorated many of the mansion's walls and doors with their work—sometimes in lieu of rent! The Florence Griswold Museum is also the headquarters of the Lyme Historical Society. Also on Lyme Street, the Lyme School of Art, Lyme Art Association and numerous private art galleries carry on the tradition of Old Lyme as an artists' town. The Lyme Academy of Fine Arts, 84 Lyme Street, is a gracious house dating from 1817 with a gallery of changing exhibits of present-day painters and sculptors. 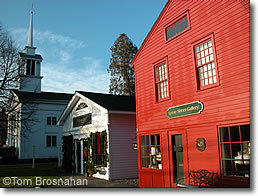 Old Lyme has two fine old inns located within an easy walk of the town's major art establishments. Art galleries and a Georgian church on Lyme Street in Old Lyme CT.